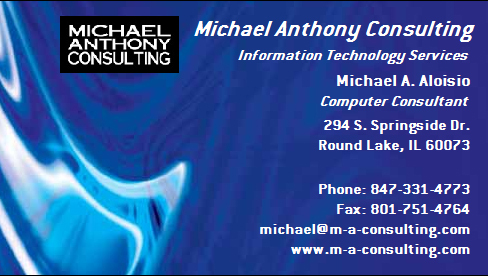 Michael Anthony Consulting provides Information Technology Services for the small to medium sized business in Chicago and the surrounding suburbs. Providing a full range of services for the individual and the corporate account, we assist in developing, implementing and supporting our clients' needs. With over 15 years of experience, we will provide you with the knowledge and expertise your business requires. If you need hardware, software, administrative, networking services or solutions, we are available.